Florida’s beaches (especially those on the Gulf Coast) are naturally beautiful and serene settings. The water is a stunning emerald-green, and gentle waves come and go along the shoreline. Being one of the only true beachfront hotels in Miramar Beach (10 miles from Destin), we know the perks of being right on the water first-hand. As a beachfront hotel, we offer guests the opportunity to step directly onto the sugar-white sands of the Gulf Coast at any time of day, or relax on our decks overlooking the serene water. Many guests use that as an opportunity to relax and unwind in this unforgettable setting — through beach meditation in the sand, or our Sunrise Yoga classes on our deck. Folks looking to relax during their beach vacation enjoy the sounds of melodic ocean waves crashing along the shore. The feeling of a gentle, warm sea breeze on your skin adds to that calm, relaxing feeling. And as you see with any beachfront hotel in the Destin area, our guests enjoy getting up close and personal with some ocean-dwelling birds. These friendly critters sing softly in the wind — providing a nice soundtrack to an afternoon relaxing in the sun. The fitness center at Serenity by the sea Spa offers Sunrise Yoga classes on one of our outdoor, beachside decks. These classes are a perfect way to relax near the beach, at the hands of a skilled instructor who will lead you through poses and breathing exercises. During our Sunrise Yoga guests can take in the beauty of our beachfront, and refresh their body and soul for the day ahead. If you’d like to try your hand at beach meditation, Hilton Sandestin Beach is the perfect place to do so. Grab a towel from our pool hut and find a spot on the sand. Close your eyes and concentrate on the sounds of the water and the feeling of the sun on your skin, the sand beneath you, and the breeze all around you. Sunrise and sunset are both great times to try meditating on our beaches, as noise levels and crowds are both smaller. 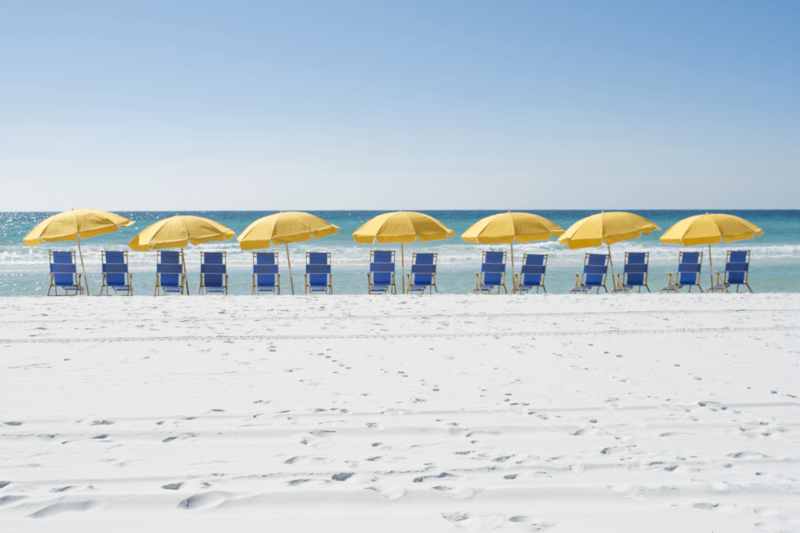 A trip to Hilton Sandestin Beach will allow you to relax your mind, body and soul along one of the best beaches in Florida. Come visit us in Miramar Beach (down the road from Destin) and take some time to unwind.